Architect Webster Wilson melds accessible features with wood accents and minimalist design. 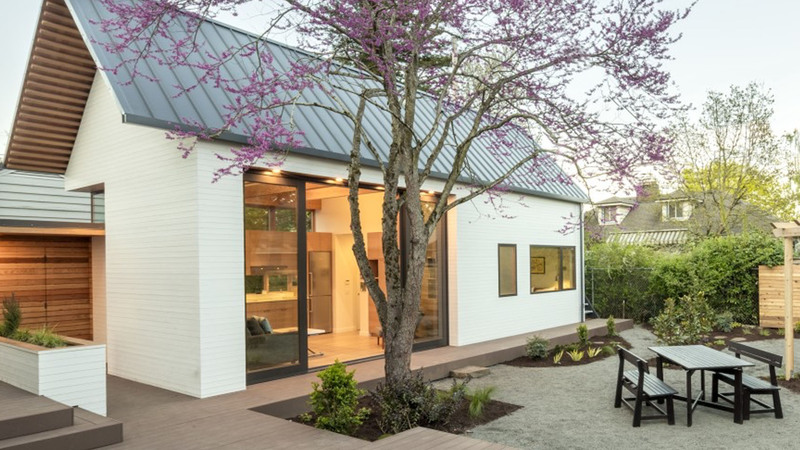 To create the ideal environment for her parents to age in place, a Portland, Ore., homeowner and her family approached local architect Webster Wilson with a retirement plan based around an accessory dwelling unit (ADU) in the backyard. According to this plan, the homeowner provided the land, and her parents financed the project and will move into the new unit when they are ready to retire, keeping the family close without overcrowding the main home. The city of Portland recently extended its reduction of permit fees for ADUs for the next two years in an effort to encourage greater housing density. Projects with two or more stories are required to match the architectural style of the lot’s main home, including its roof pitch and window proportions, and must undergo a design review before they are approved. “The city’s goal is to try and encourage a neighborhood cohesiveness, if they’re going to allow these ADUs,” Wilson says. The unit is arranged in a 16-foot-by-32-foot rectangle against the setbacks in the corners of the lot’s backyard, with a small bedroom, full bathroom, and multipurpose living room spread across 600 square feet. The living room entryway is built into a 10-foot, floor-to-ceiling glass wall that opens onto the garden and faces the main home. The interior sets wood flooring and cabinetry against white walls and stainless steel appliances. Most of the living essentials are built into the cabinets, able to be concealed when not in use. While the home was not built to be ADA compliant, all of its components are designed around accessibility and aging in place. The shower is curbless and wheelchair accessible, and none of the unit’s doorknobs, handles, or cabinet pulls require users to twist their hand to open them, due to concerns about arthritis. The entryway incorporates a series of connected storage sheds that mimic the look of cedar fencing, and connects to a pair of wheelchair ramps that lead to and from the driveway and the main home. All of the wood used throughout the project was locally sourced and sustainably harvested in the Northwest. 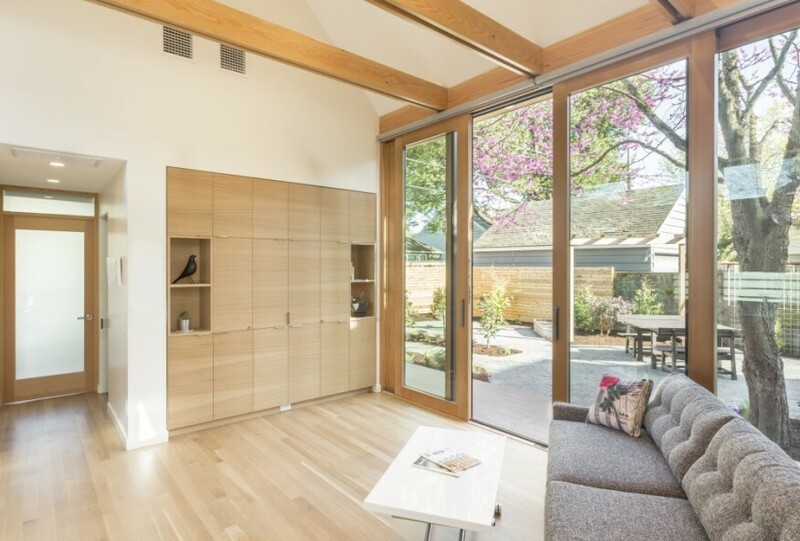 Douglas fir was used for the framing, soffits and trim, western red cedar for siding and fencing, and Oregon white oak for flooring and cabinetry. LED lighting, efficient appliances, and a high-efficiency ductless mini-split system augment the small unit’s inherent energy efficiency.